I've had this cd and have been listening to it for a few weeks now, but have held off my review until now. This album is certainly one that takes time to digest. Arachnes does not rely on catchy melodies and big hooks to satisfy the listener. The technical skill of this band is very impressive and you cannot appreciate the skill of this band or the detail of the song structures after just one listen. Arachnes play what I would best describe as a hybrid of neoclassical, progressive, and power metal. It's a mix that works well for the band as the end result is sound all their own. Arachnes hail from Italy, and I believe this is their fourth album. There has been an explosion of new metal bands in Italy, many of which feature poor production and lousy vocals. 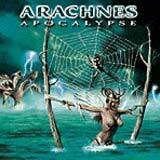 Arachnes certainly breaks from that mold as the singer is very talented with his soaring and majestic vocals and the production is tight with all instruments at just the right levels. The vocals tend to get buried in the mix from time to time, but it's not a disaster by any means. The extensive, but smart use of keyboards meshes with the music just perfectly. The songs are very technical in nature, requiring the listener's full attention to appreciate. The rhythm section is tight and powerful while the guitarist is powerful, yet very technical at the same time. Thunderous double bass drumming is prevalent on most songs, giving this album a lot of punch. The songs themselves are quite diverse with plenty of time changes and tempo changes to be found. You will also hear some progressive breaks and properly placed instrumental tracks (Prayer Part 1, Decisive Battle, and Realm of Spirits) on this album, creating a very enjoyable atmosphere. It's hard to identify one or two songs as the highlights of the album. You really need to just kick back and listen to this album from beginning to end with your full attention to really "get it." There are no boring moments at all as the atmosphere and technical prowess of the band will absolutely keep your attention. Fans of powerful prog metal (with neoclassical influences) will want to check this album out. This band has a lot of technical talent and the ability to engulf the listener with their music.